On Thursday morning, there was some more work being done on the northeast corner of Washington and Centinela. A few guys from Blaine Tech Services were laying out blue pipes and feeding skinny white tubes into holes in the middle of cement squares in the ground. 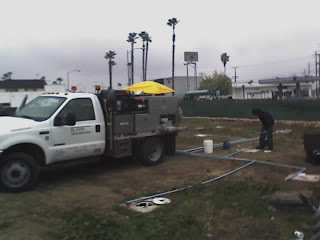 Blaine Tech Services are groundwater sampling specialists according to their web site. I don't know where groundwater sampling falls in the process of preparing for construction, but it is good to see some more activity on that corner.